Identification: The Monk parakeet is a parrot of average size, reaching a length of about 29cm (11 1/2 inches) from head to tip of tail. Both females and males have a bright green body, gray forehead, cheeks and breast, blue-black flight feathers, gray legs and a rosy, pale orange or yellow beak. This parrot is the only species of its genus, and is the only Psittaciform that builds its nest out of sticks. Original Distribution: South America, ranging from central Bolivia to south Brazil, Uruguay and southern and central Argentina. Current Distribution: Established in areas throughout Alabama, Connecticut, Delaware, Florida, Illinois, Louisiana, New Jersey, New York, Oregon, Rhode Island, Texas and Puerto Rico. More specific regions where the bird resides include: Austin, Dallas, and Fort Worth, TX; Chicago, IL; New Orleans, LA; Portland, OR; Jacksonville, Ft. Lauderdale, Boca Raton, St. Petersburg, Tampa, Brevard Co., Pinellas Co., Pasco Co., FL; Bridgeport, CT; Barrington, Warwick, RI; and, Brooklyn, NY. Site and Date of Introduction: It is unknown how long the Monk parakeet has been in the United States due to the pet trade. However, it is believed that the Monk parakeet first became problematic as an invading species in 1968. Modes of Introduction: They were released throughout the eastern coast of the United States both deliberately and by accident. 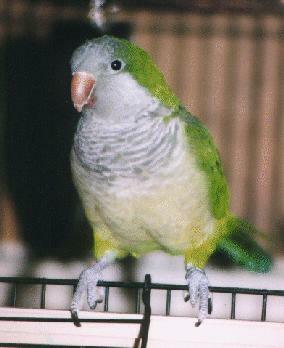 From 1968 to 1972, 64,225 parakeets were recorded to have been imported to the United States through the pet trade. In 1968, the birds escaped in JFK airport through damaged crates. The birds have also been released either deliberately or by accident by their owners. Some zoos, no longer wishing to maintain their Monk parakeet exhibit, also released their holdings. Reasons Why it has Become Established: These birds are plant generalists. They have been observed, in their native and nonnative habitats, to eat plant buds of the Poaceae and Rosaceae families, weeds, fruit, and berries. In the winter months, they eat bird seed from birdfeeders. Monks have their largest population within the United States in Florida due to the large number of flowering, nectar and fruit-producing ornamental and exotic invasive plants that reside in that state. The semi-tropical weather of Florida also makes this state the most habitable of the other states. However, since Monk parakeets are indigenously from the mountainous regions of South America, where temperatures can reach 20 degrees Fahrenheit, they are adapted to colder temperatures as well, which is why they are also proliferating in states like Illinois, New York and New Jersey that experience cold winters. Monk populations are also growing because the United States is becoming more and more urbanized and disturbed, where ornamental plants, including tropical ones, are being established, thus setting up a larger niche for the Monks to fill. Ecological Role: The monk parakeet is primarily an herbivore, eating seeds from plants of the Poaceae, Asteraceae, and Cyperacea families, in addition to corn, wheat, barley, millet, fruit, berries, and sometimes insects. They are known to travel large distances to feed, and in that process spread seeds throughout their flying range. It is unknown if this is the case in their nonnative habitats, since their nonnative habitats tend to be cities, where the birds do not have to travel as large distances to locate food. Benefits: Monk parakeets positively play on the psychology of the inhabitants of the areas they have invaded, since most of these places are cities which contain very little wildlife. These gregarious, bright birds add a natural element to city streets, which often support little plant and animal life. Threat(s): In South America, the parakeet is considered a major agriculture pest, where flocks devour cereal grain and citrus fruits. In the United States, the bird is not yet an agricultural threat and an ongoing debate exists as to whether or not it even has the potential of becoming a pest. It does have other impacts, however, although they are not very widespread. Monk parakeets have damaged power lines and caused short circuits in urban areas. 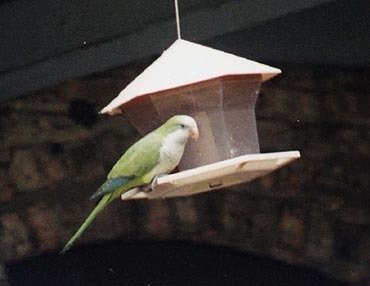 It is thought that they might compete with urban species of birds and maybe even natives, for food and nesting sites, but this claim has not been thoroughly studied and is based on a few instances where monk parakeets have been spotted fighting with blue jays, robins and house sparrows. However, ecological principles indicate that if monk parakeets continue multiplying, which is currently the case, they will become a threat, or at least a serious competitor, to urban exotics, like pigeons and house sparrows, which have become synonymous with cities. They also might become a threat to the few natives, like the robin and blue jay, that still struggle to survive in cities. Control Level Diagnosis: Medium priority: should be kept under strict surveillance. Monk parakeets are abundant where they are established and their populations are increasing. As they spread, there is a chance that they will become agricultural pests. Control Method: In the 1970's, US Fish & Wildlife service implemented an eradication plan of these birds, which was unsuccessful, only removing these birds from the state of California. Campbell (2001) insists that this species, like any other exotic, should be controlled as a safety precaution, for it is much easier to prevent the establishment of a species than to eradicate the species after it has proliferated out of control. In order to prevent a monk parakeet explosion, it is necessary to control its resources. The abundance of food sources, like birdfeeders, ornamental and exotic tropical fruit trees, make it difficult to prevent population growth. Since it's resources are so difficult to limit, the only other option left is to reinforce a plan to decrease the Monk's feral population. Killing these birds would not be an option since this would upset the animal-right's activists and profuse bird-lovers. The best solution might be to replace these birds into the pet trade, since they are popular pets, are rated as one of the top ten best speaking parrots, and cost only about $150 within the states. Campbell, T. S. 8 October 2001 (10 October 2001). The Monk Parakeet, Myiopsitta monachus. Institute for Biological Invasions Invader of the Month. http://invasions.bio.utk.edu/invaders/monk.html.